I took a walk round the graveyard of St. James' Anglican church in Didsbury on Sunday. Interesting place. Loads of chicken-wire type grating over most of the windows, which is a pity since the actual stained glass imagery behind would have looked so much nicer. And it seems like the place isn't totally well kempt. I found a tomb. 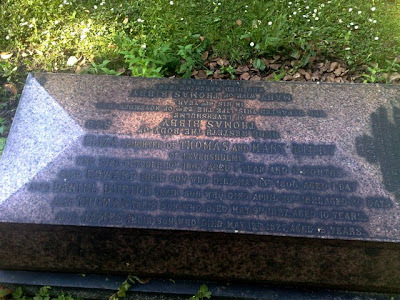 There's about 8 bodies resting in it and as I started to read it, it moved me. 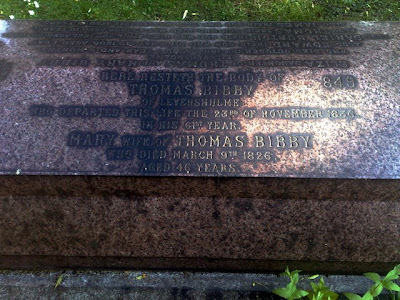 It tells a story of a 19th century family: the Bibbys from Levenshulme. It begins with Eliza, Thomas & Mary's 20 month-old toddler who died in 1803. Then there's the 1 day-old Edward who died 2 1/2 years later. And there's Daniel Burton (10) who died 15 years later aged 20 days and two other brothers: Thomas (10) and James (18) who died within 3 days of each other in 1927. I started to think about how much grief this family had had to put up with. So many children they undoubtably loved and yet lost over such a long period. How did they carry on? Could we have done the same? 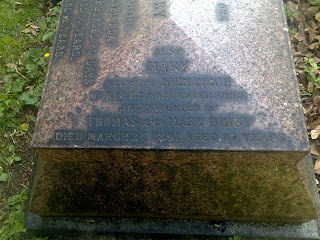 And it gets worse - Mary, their mother died in 1826; so Thomas had to endure the loss of two more sons only a year after the mother. And he himself only lasted another 9 years. I'm stunned. How did people hang on with such trauma?But then I noticed something else. Another name. At the end, Mary, another daughter (their only remaining one? ): died in 1891 aged an incredible 87 years. I think what it says is that these people had real faith in a way rarely seen today. They ploughed on when most of us would have given up. And it bore lasting fruit in the long-term - maybe Mary's descendents are around today. I was moved.